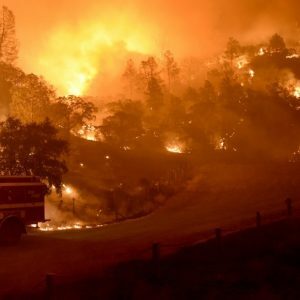 California wildfires as of November 16th 2018, 63 confirmed dead and 9700 houses burnt. Why is this happening? Short answer was succinctly explained over a year ago in this video. Since posting that video, things are looking a little bit better for the United States, but otherwise everything is still heading exactly as explained. Now that more people are listening, I wanted to give more explanations. – These wildfires started a few years ago when the collective consciousness of the trees (centered at the Amazonian Forest) accepted to take responsibility to anchor Heaven energies into the earth since humans wouldn’t do it. They took the heat and the fires immediately started. – If you add water energy to the fires through the mind, it only causes energies to explode stronger, like adding oil on fire. – Trees and telephone poles act as energy conductors and overheat like wires, thus they turn into charcoal red from within when the outside is still interact. Alchemical fires behave differently than regular fires. – It is suspected that the fires started with electric malfunctions which can definitely happen due to burst of earth/fire energy. It’s hard to put it out when water makes it explode and when trees melt from within out of nowhere.